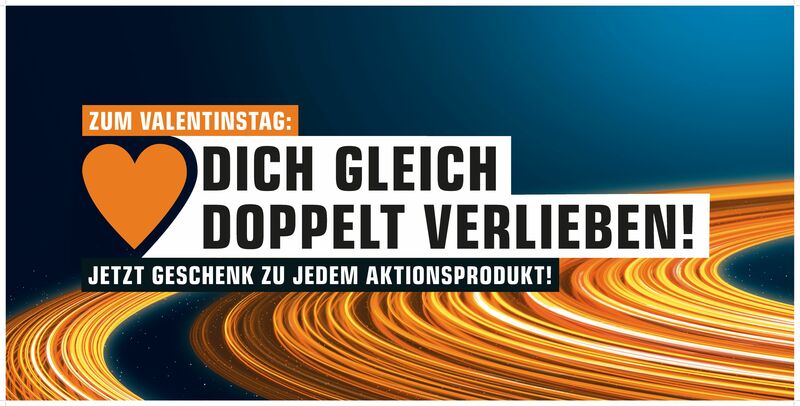 Ingolstadt, 08.02.2019: With Valentine’s Day on 14 February fast approaching, it’s high time to sort out a present for your loved one. These days, flowers and chocolates are no longer enough – what you need are the latest tech gadgets! And Saturn has come up with some fantastic present duos: 14 selected products which all come with an amazing free gift, making them ideal for couples! This promotional offer will take place in the week around 14 February. It’ll start in Saturn’s online shop at 8pm on Saturday 9 February and continue until 9am on Monday 18 February. In addition, the special offers will also be available at all Saturn stores in Germany from 11 to 16 February. For its Valentine’s Day campaign, Saturn has compiled 14 product packages which will definitely come in useful for couples. They include the Huawei Mate 20 smartphone with an integrated triple Leica camera, which comes with a Huawei CV80 Pocket Printer and photo paper. Then there’s the Dyson Supersonic hairdryer in anthracite and fuchsia along with a gorgeous-looking pink travel hard case. Or how about the latest Apple MacBook Air 13" including a 12-month licence for Office 365 Personal – or a Philips Saeco SM 5570 coffee machine with a free home demonstration by an expert from Technikberatung @ Home? Other Valentine’s Day promotions include a Sony headset and Bluetooth speaker bundle, a 43" 4K TV with Ambilight from Philips paired with a €20 shopping voucher, a Braun electric shaver including cleaning cartridges, and a Philips handheld cordless vacuum cleaner with 360° suction nozzle together with a free Philips electric toothbrush. Other special offers include the Sony Alpha 600Y camera plus a spare battery, a Samsung T580 Galaxy Tab A with a €20 shopping coupon, and two identical Denver fitness trackers almost for the price of one – perfect for couples who like jogging together! There’s a TomTom satnav with free TMC, a Trekstor A13B Surfbook including a one-year software licence for the Office 365 Personal suite, and the Remington S6500 Hair Straightener with a free compact hair dryer, which is especially practical when travelling. All 14 promotional pairs are presented in detail in Saturn’s online shop. And they’re easy to find in-store thanks to Saturn’s eye-catching Valentine’s Day decorations!